Introducing Fido to Rufus: Dog-to-Dog Greetings, Pressure Free! We want our dogs to have other doggy friends, but dog to dog interactions can be tricky events, for a few reasons. 1) If a dog hasn’t been socialized appropriately to other pups starting from a very young age (and continuing into critical developmental periods), he may not know how to interact appropriately with other dogs. 2) Different breeds have different play tactics, some of which can be off-putting or seen as rude by other breeds. 3) A dog who gets overexcited around other dogs starts off with a high level of arousal before he even begins interacting with another dog, which then can send him over the edge. 4) Dogs that are fearful of other dogs can easily be intimidated by dogs with strong personalities and will fight back to protect themselves if they feel it’s necessary. 5) It’s natural for dogs to figure out where in the hierarchy they rank when meeting one another, and to tell another dog off when he’s being inappropriate, but what behavior is appropriate versus which behavior is aggressive? And there’s much more to consider as well. Let’s say you’re going to a new business meeting, in a new place with a bunch of new people, where you just accepted a new job. You’re not a big party person and aren’t comfortable striking up conversations with people you don’t even know, and you don’t know anyone else in the room. You will be meeting your new boss for the very first time. You hope your new boss will like you and that you make a good impression; if you don’t, he won’t give you the job and you really need the money. When your new boss finally does come up to you, he stands tall, leans into you, looks you straight in the eye, gives you a monster handshake that practically pulls your arm out of the socket and says to you simply in a booming voice “You think you have what it takes to make it here – good luck.” I don’t know about you, but what I get from this scenario equals a lot of PRESSURE!! Maybe you can think of dog to dog greetings as similar scenarios. If a dog is already excited or overwhelmed with all that’s going on around him, and now he has to meet a new dog for the first time, on that dog’s stomping grounds, where that dog comes up to him strongly in either an overexcited or intimidating fashion, and tries to dominate him - it can be A LOT to handle! So by following these steps and taking the pressure OFF, your dog will be more likely to accept another dog in his personal space willingly and appropriately – which makes a more positive interaction for all! Do the introduction on neutral ground. Instead of in your house or yard (where an existing dog may get territorial), try a quiet side street or park that has no particular connection to either dog. Go for a walk together instead of a head-to-head dog greeting. When two dogs face one another and lock eyes, it’s a challenge to see who ranks highest on the hierarchy, and one will have to back down. This sounds more like a confrontation (with a lot of pressure) than a casual meeting. Especially if those dogs are pulling and lunging towards one another, they are already starting out with a high level of emotional arousal right out of the gate. Going forward with a greeting at this point will automatically increase the already-high frenetic energy. Think of it like a kid who has been bouncing off the walls – if he tries interacting with other kids while he’s in that emotional state, things often just become more chaotic! Letting two dogs meet by running around uncontrollably in a fenced yard can cause their arousal levels to rise quickly and can result in chaos. 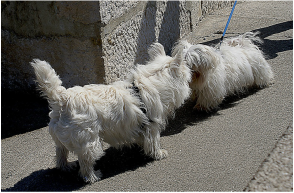 ​Have both dogs on leash so you can limit their options if necessary and set them up for success. Most of the time, it’s easiest (and less stressful for the dog) if you use a long leash (NOT the retractable kind, which gives you no ability to set clear parameters, but a 12-15’ long training lead - see my article, Why Using a Long Line Makes for a Better Walk for You and Your Dog for details). A long leash gives your dog space to move his body and explore, but you can still have full control over him. The key here is going to be RESPECTING the leash - keep the leash LOOSE as often as possible, and do not use the leash to manage the dog (as pulling back in the leash is not only a nagging feeling to your dog – nobody likes to be tugged – but it leads to increased arousal as well). You will want to stay calm with the dog and use calm and confident communication and redirection techniques. If the leash gets tight, it should only be calm, steady pressure as you limit the dog’s options and he tries to go out of your bounds, but you should resist the urge to pull back and reel him in towards you. If you have to get closer to the dog, work your way down the leash as you gather it up to decrease the distance. It's natural that there will be tension on the leash in the beginning of this exercise, as your dog pulls more, but you should find that tension in the leash will decrease as you continue. You should be directing the walk, not letting your dog dictate. This exhibits strong respectable leadership. You may respect your dog’s need to have some space to explore, but that means that if the dog tries stopping to mount the other dog, you redirect him by matter-of-factly saying “let’s go” and moving again. If you build up a strong “let’s go” = we’re moving mentality before attempting this (by practicing saying “let’s go”, moving like you mean it, and then praising and rewarding the dog as soon as he moves with you), you will have a better chance at success. Your goal – just keep moving! If dogs are able to walk and explore, they are focused on some things other than just “I see a dog, I must pounce on him!” Yet they can still get information about the other dog by watching that dog’s body language, taking in his smells, and they may even find they like to explore the same things together. Start at a distance where the dogs can see one another but they can still keep a certain level of calm about them (before they start going berserk). That’s why a park or side street are good options – you can be on one side of the street with your dog and the other handler can be on the other side of the street with their dog, or across the park as distant as needed. Dogs should be walking parallel to one another at first, as if in a marching band, instead of towards one another, as this removes the pressure and is more conducive to peacemaking behavior. It is best to move back and forth in the same area for a bit (like walk 30 yards, do an about face and walk the 30 yards back, and then turn and do it again, the dogs remaining parallel to one another the whole time). Doing this will take the novelty out of the situation and begin to settle the dogs as it feels more routine (rather than continuously moving to new places). Once the dogs are more settled, you can continue to walk further distances together or can allow the dogs to come towards one another from an unparalleled direction. This may look messy at first, since both dogs may have an interest in pulling towards one another. You should keep your leash short enough where they can’t touch one another but long enough to give him space to move so you’re not tripping over him. There is time later to clean that up, but right now it’s more about the calmer introduction to the other dog than it is about leash manners. If you and the other handler just keep moving like you’re on a mission, you will notice after a few minutes that the dogs will start giving up some of the urge to pull towards one another. They will face and walk forward, break eye contact from the other dogs, even move off to the side to sniff. When you feel this happening, be sure to give the dogs plenty of praise so they know it’s a good thing that they stopped trying to pursue the other dog! And you will find the leash getting looser and looser. Gradually, as the dogs settle in, you can decrease the distance a little at a time, and you may even find that within a few minutes they are walking right beside one another in their own little pack! While the following videos are not the best visual quality, you may be able get the general idea of using this technique. The two dogs in this video were known for being reactive on leash with other dogs. For one dog, she particularly had a hard time with other females getting into her personal space; the other dog would get extremely excitable when seeing other dogs. Unfortunately I didn't get a video of the beginning of the walk (as I was too busy coaching my clients to think of it! ), but these videos are from about 20 minutes into our walk. You can see in the second video how close the girls can be without showing much interest in one another! Pay attention to each dog’s body language. Watch each’s dog’s ear set, tail set, fluidity of movements and shape of the body, breathing patterns, and look for signs of stress or arousal. To learn more about identifying body language and context, How to Speak Dog by Stanley Coren is a great book. Keep in mind that a dog’s emotions may shift quickly, which will be told by his body language, so it’s always a good idea to supervise dogs that are new to one another closely, and not take the event of their initial greeting to mean they won’t have a disagreement if the situation changes (i.e. one dog becomes too rude, a new dog enters the picture, a dog hurts himself during play, etc). Dogs also take cues from our own body language, so standing stiffly as we hold our breath and stare at the two dogs to see how they are going to interact can signal distress to our dogs and give them a reason to feel uncomfortable about the interaction. And frenetic energy in the form of our fast movements and excited tone of voice can actually cause our dog to rev up as well. It’s best for you to remain calm and purposeful in your body movements, breathe calmly, and relax. If you act nonchalant about the interaction rather than tense/concerned or excited, your dog will be more likely to see it as casual as well. 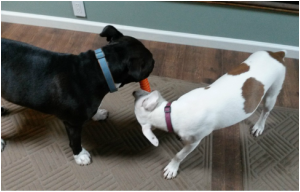 ​Even if dogs are now acclimated to one another and seem to be getting along, it’s a good idea to let them play for a few minutes, then reel their focus back to you (either by a recall or a gentle hand in each collar to separate the dogs) so they can have a chance to “catch their breath” and take a break from playtime. Throwing in a few of these breaks into each play session will do three wonderful things: first, it helps an excited dog to calm back down instead of continue to build in arousal until the point where he loses his mind; second, it will teach your dog not to run away from you if you approach him or call him during playtime – it doesn’t mean that playtime has to end, sometimes he gets to go back and play again! ; and third, it helps strengthen your relationship with your dog if he can realize that it’s good if you approach him or call him away from playtime because great things happen – he gets plenty of love and treats from you! Doing this will also result in dogs that will be able to settle around other dogs and not just keep roughing it in nonstop play. ​To ensure your dog has positive interactions with other dogs, I recommend allowing your dog to meet only dogs that you know personally. While it’s common for dogs to see other dogs while on a walk and want to check them out, allowing greetings with random dogs have the risk of resulting in a negative experience. How do you know if that other dog is really friendly and won’t try to bite your dog? What if that dog isn’t vaccinated or is carrying a transmittable illness? Or what if that dog just likes their personal space and doesn’t want to share it with your dog? Having a negative experience with other dogs can set your dog’s confidence back a bit, so it’s better to set up greetings with dogs that you know will leave a positive impact on your best four-legged friend. Watching two dogs play can be a very fun and amusing way to spend some time - if the dogs get along and everyone is enjoying themselves! If you would like help implementing these practices with your dog to set him up for the opportunity to make more doggy friends, contact Maria at (845) 549-0896 or maria@mghcanineconsulting.com.